The United States Department of Justice (DOJ) said its civil lawsuit to seize 1MDB-related assets includes all relevant details so that reasonable belief can be proven during a trial. It is responding to Minister in the Prime Minister's Department Abdul Rahman Dahlan who said that the DOJ is insinuating criminal misconduct by prime minister's wife Rosmah Mansor by linking her to diamonds allegedly bought using cash misappropriated from 1MDB, even though it has no intention to seize the jewellery. "The law requires we allege sufficiently detailed facts to establish a reasonable belief that we will prevail at trial,” the DOJ told Malaysiakini through email. "This means we have to allege enough facts to show a reasonable belief that United States money laundering and other criminal laws were violated and that the subject assets were involved in or traceable to these illegal transactions. "In addition, the complaint provides a sufficient detail to specifically identify the property subject to forfeiture and to clarify the basis of the government's case should anyone with a valid claim wish to challenge our case. Identifying persons and entities aids that function. "No conclusions should be drawn, one way or another, about the status of individuals or entities simply because they are named in the documents." The DOJ in a new filing last week said that US$4.5 billion (about RM19 billion) has been allegedly stolen from 1MDB. It is seeking to seize US$1.7 billion (RM7.3 billion) worth of assets, which it says were bought with stolen money in the US and elsewhere, under the country’s money laundering laws. The DOJ's 251-page lawsuit filed Thursday did not name Rosmah, but mentioned that the wife of an unnamed "Malaysian Official 1" (MO1) was gifted about US$30 million worth of jewellery by 1MDB-linked individual Jho Low. 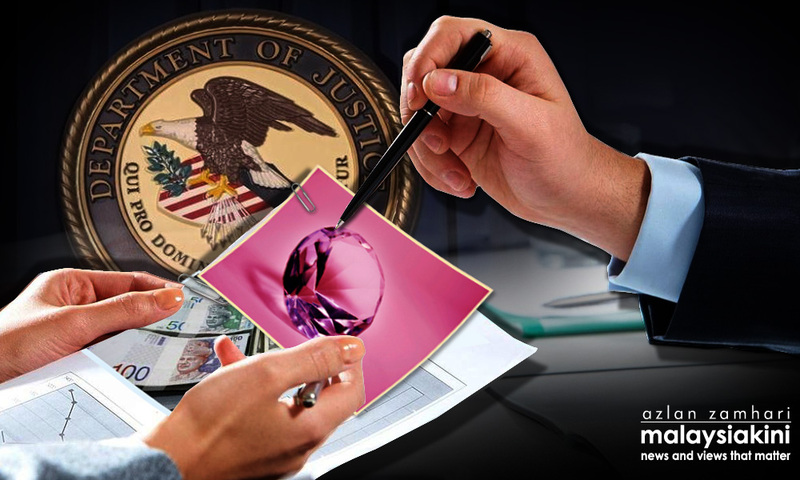 DOJ told Malaysiakini it is not seeking to seize the jewels gifted to the wife of "MO1". Abdul Rahman yesterday named Rosmah in relations to the DOJ's claims. He had last year also identified MO1 as Prime Minister Najib Abdul Razak, but stressed that Najib is not named as a defendant in the case. Najib has denied all wrongdoing related to 1MDB, while attorney-general Mohamad Apandi Ali has exonerated Najib and condemned the DOJ for implying the PM is connected to criminal misconduct. Low, whom the DOJ named, is nevertheless a Najib family friend while another defendant, Riza Aziz is Rosmah's son. In response, Low said the DOJ's claims are baseless. What's in DOJ's third and latest bombshell?